Liquid crystal thermochromatic (changes colour with temperature change) thermometer strips are a simple easy to use method of measuring temperature. Your fridge has a temperature thermostat , but how do you know the correct temperature of 3- 5 deg. C is being maintained ? These liquid crystal thermometer strips are stuck on to the side of the fridge/Cooler at different heights so you can check the temperatures at different levels. If you are selling food the fitting of these strips to your fridge/Cooler is bound to impress the food inspector ! The Liquid Crystal Thermometer Strip is a 12mm x 84mm temperature sensitive self adhesive plastic strip with easy peel release paper and 5mm high easy to read numbers. When the Actual temperature is 1°C below the pocket temp the digits are blue. When the Actual temperature is 1°C above the pocket temp the digits are brown. The Liquid Crystal Thermometer Strip is a 14mm x 76mm temperature sensitive self adhesive plastic strip with easy peel release paper and 5mm high easy to read numbers. 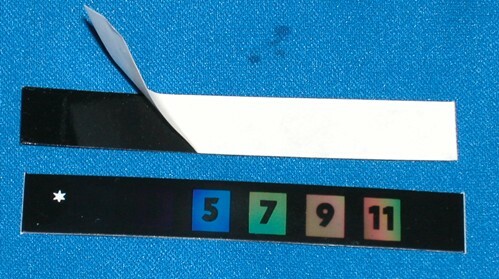 The Liquid Crystal Thermometer Strip is a 15mm x 76mm temperature sensitive self adhesive plastic strip with easy peel release paper and 5mm high easy to read numbers.